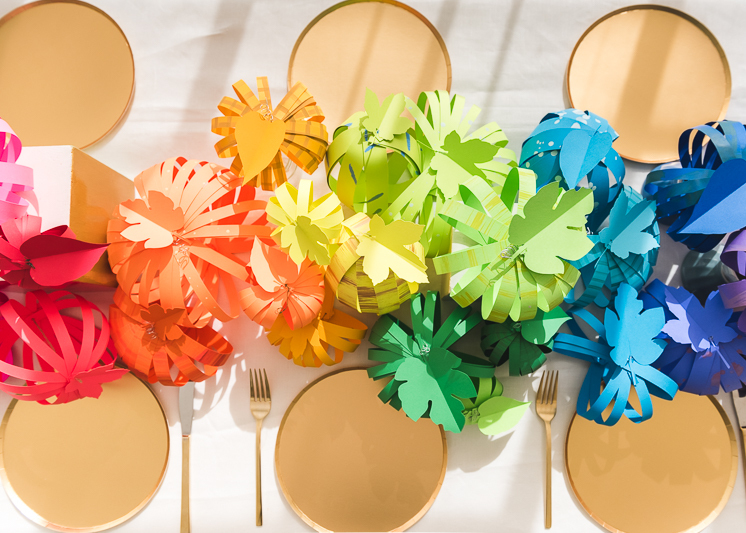 If you’re looking to colorize your Thanksgiving table for the upcoming festivities, this Rainbow Paper Pumpkin tablescape is just the ticket! 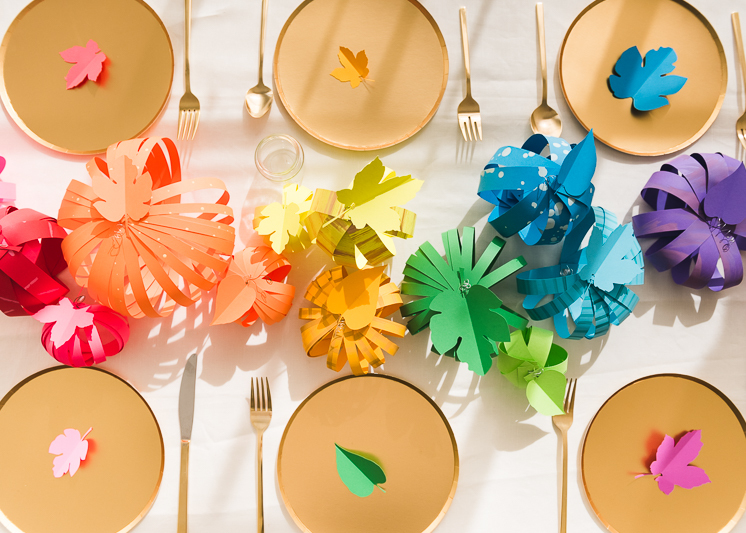 Thanksgiving is one of my favorite holidays and is the ideal time to create a really beautiful tablescape.The beauty with this arrangement is that not only is it colorful, festive, and beautiful, it’s paper and completely disposable, making it perfect for a meal with kids. 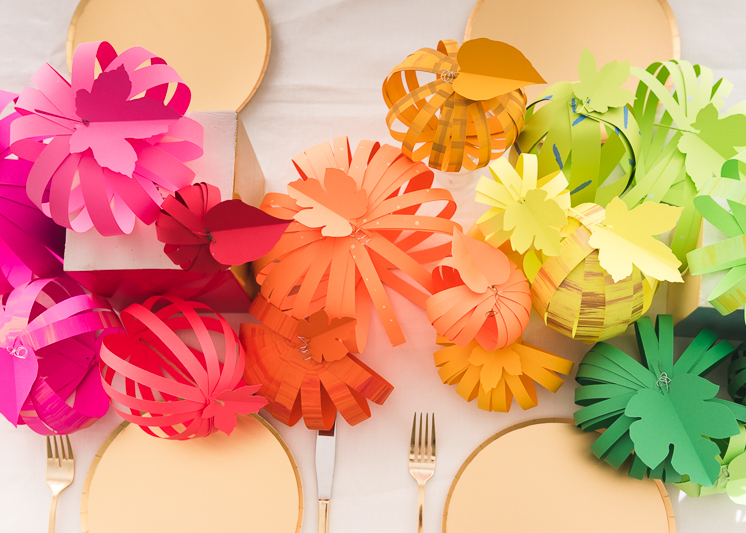 You don’t need to worry about broken dishes or decor, you can simply enjoy the meal and the company! 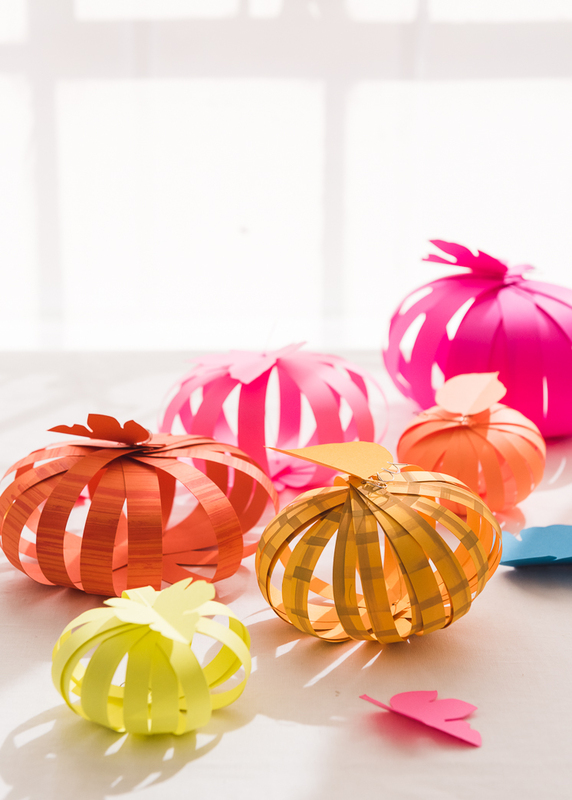 Each pumpkin is made from 1 piece of ASTROBRIGHTS®paper and some craft wire, making it extremely inexpensive to boot. 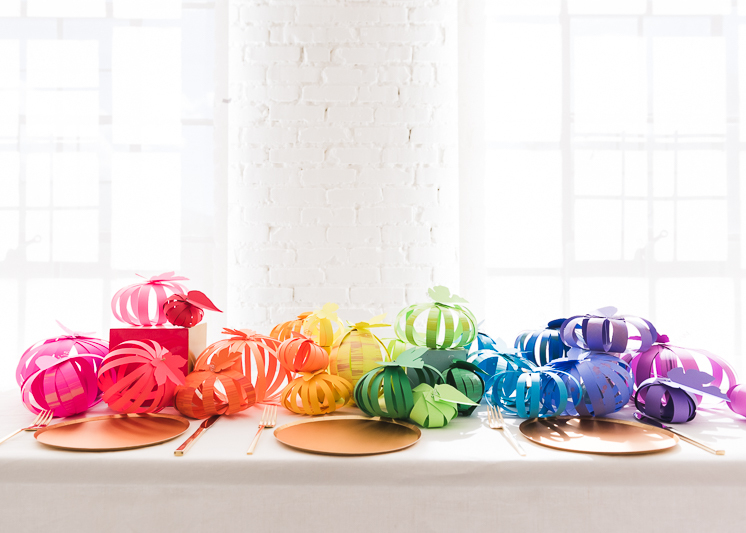 Astrobrights Paper offers the most vibrant colored paper and we were so enamored that we knew we had to create a rainbow arrangement. 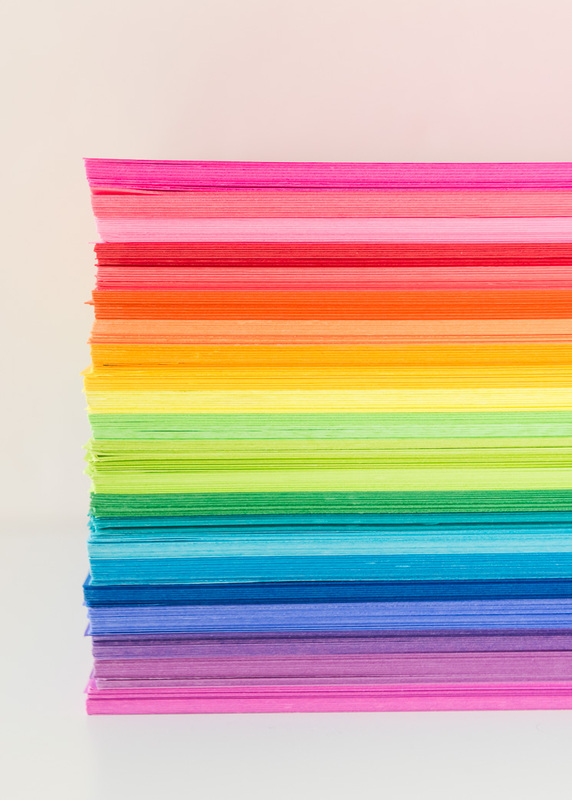 We used almost the colors in the Spectrum Assorted Cardstock pack to create a beautiful rainbow. 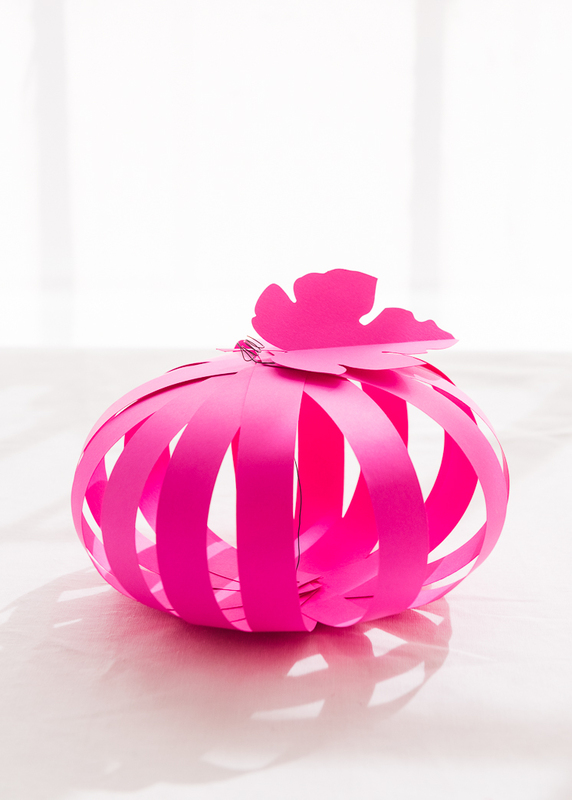 See how easy it is to replicate with Astrobrights Paper! 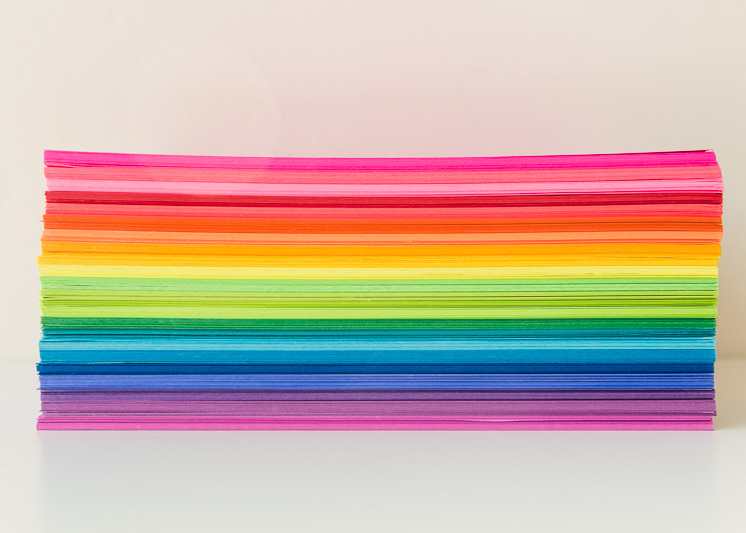 Colored cardstock from Astrobrights Paper. 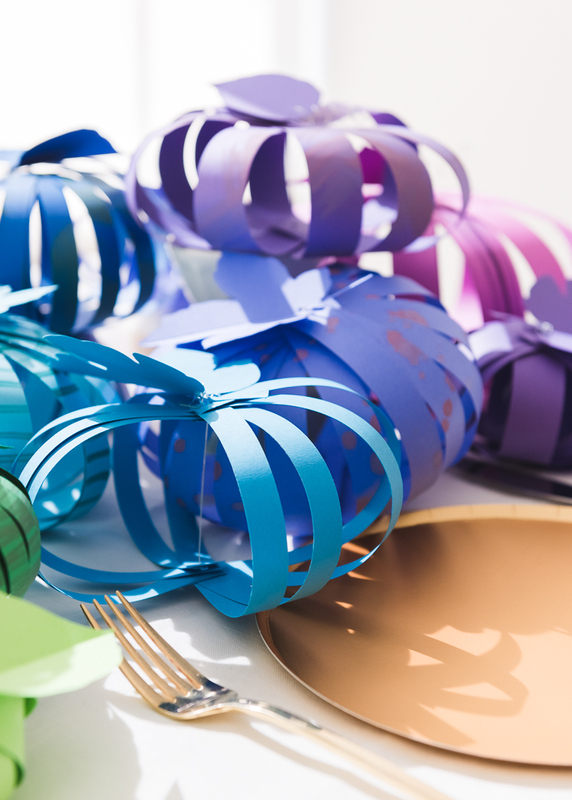 We used the Spectrum Assorted Cardstock. Paint or texturize your paper if desired. 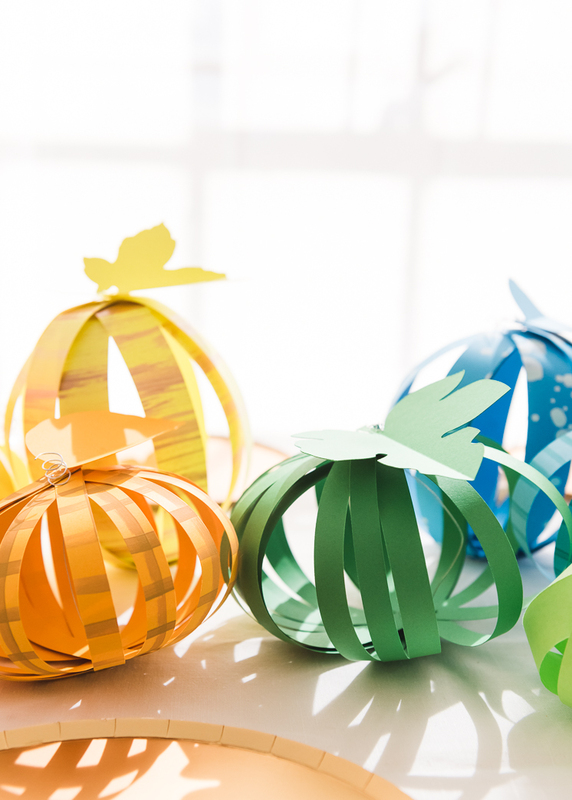 Cut your pieces of paper into strips. 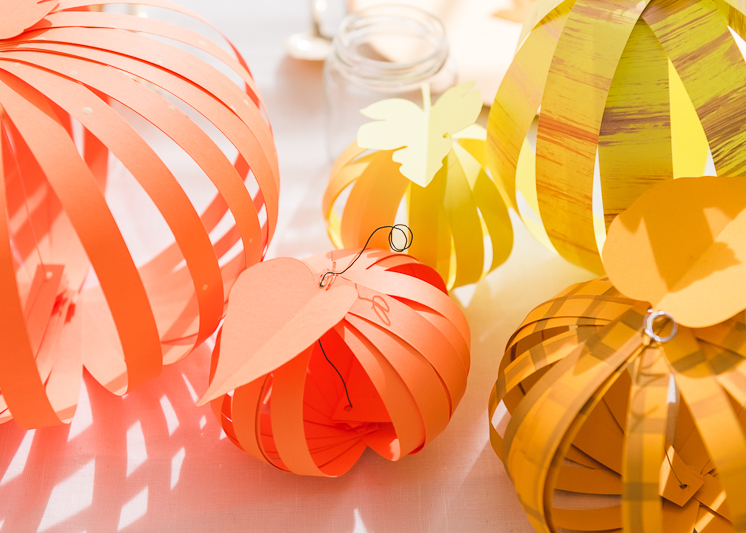 We used various thicknesses: 1/2-inch, 3/4-inch and 1-inch thick pieces that ranged in length from 6-inches to 11-inches. 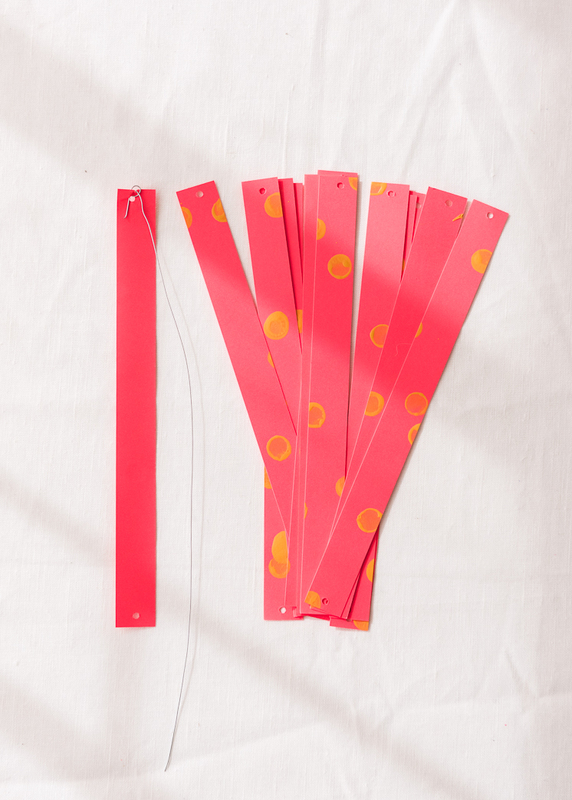 Punch holes in both ends of each strip of paper. 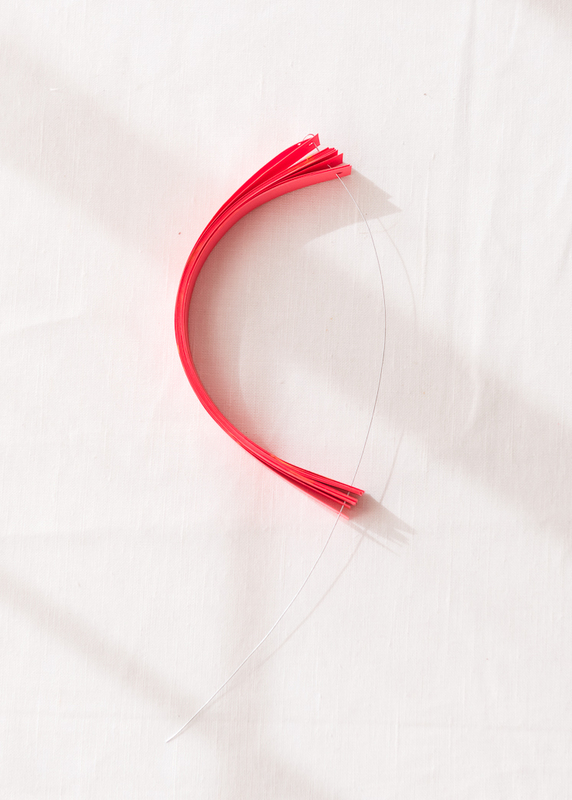 Take one strip of paper and thread the wire through the top hole, loop the end of the wire through the hole a sceond time to secure. 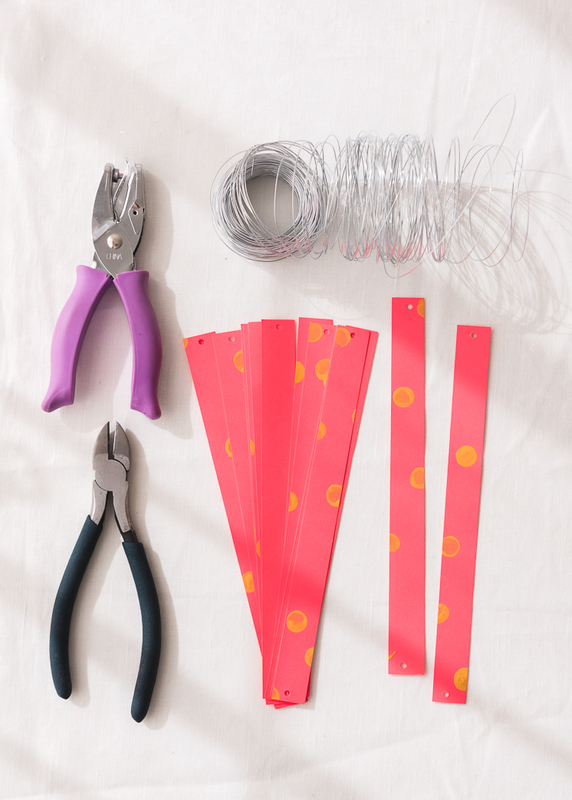 Thread the remaining strips onto the open end of wire. 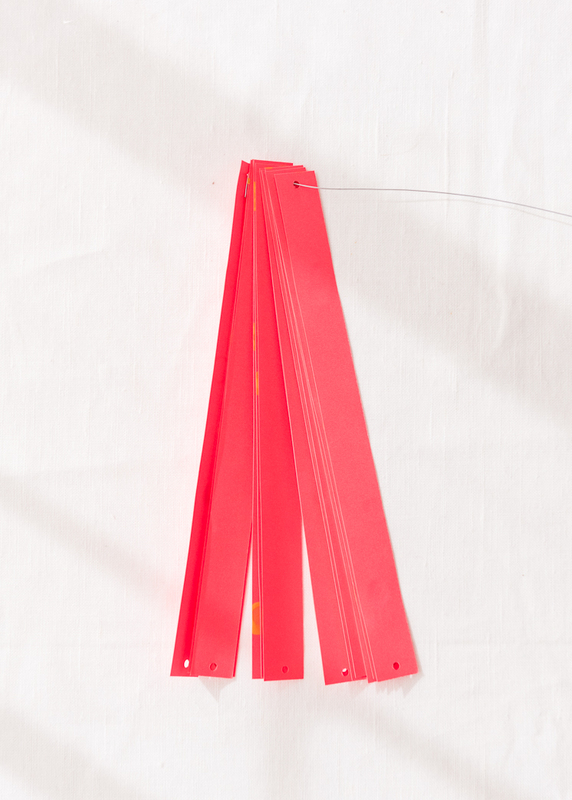 Then thread the bottom of the strips onto the wire through the punches holes. Pull the wire through until you have the pumpkin at the height you want it. 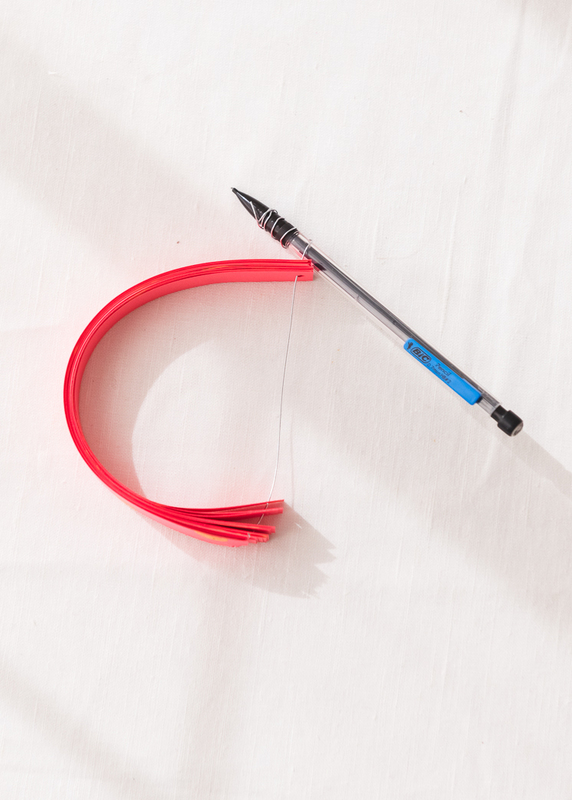 Take the tale of the wire and wrap it tightly around a pencil into a curly q–this will keep the pumpkin in place and won’t allow it to unravel. 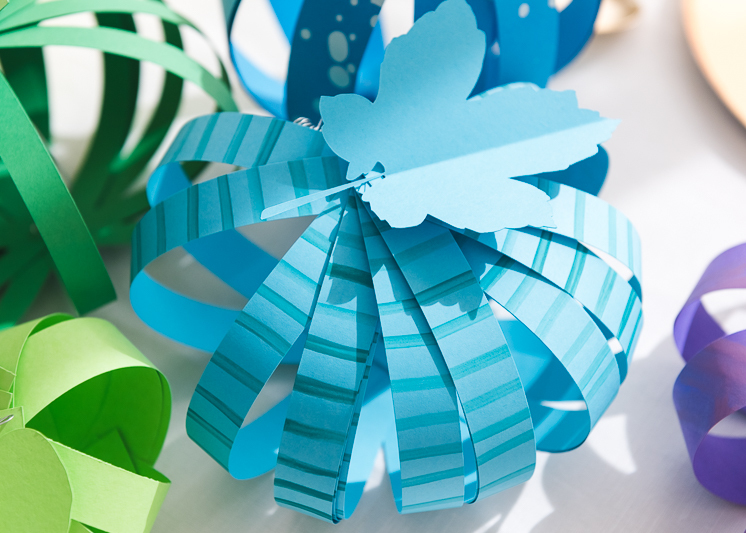 Spread out the strips to make a circular shape. Add a leaf to the top. 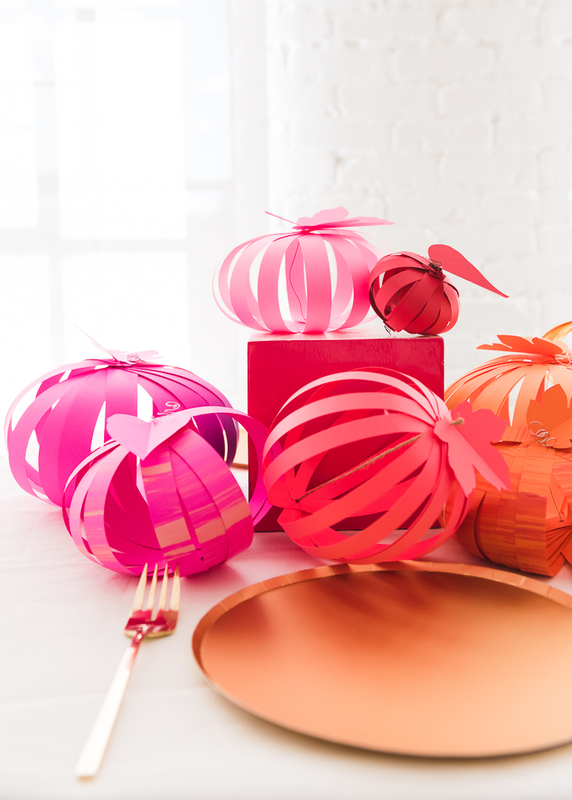 This Paper Pumpkin Tablescape is a simple way to add a festive touch to your table for the big feast! 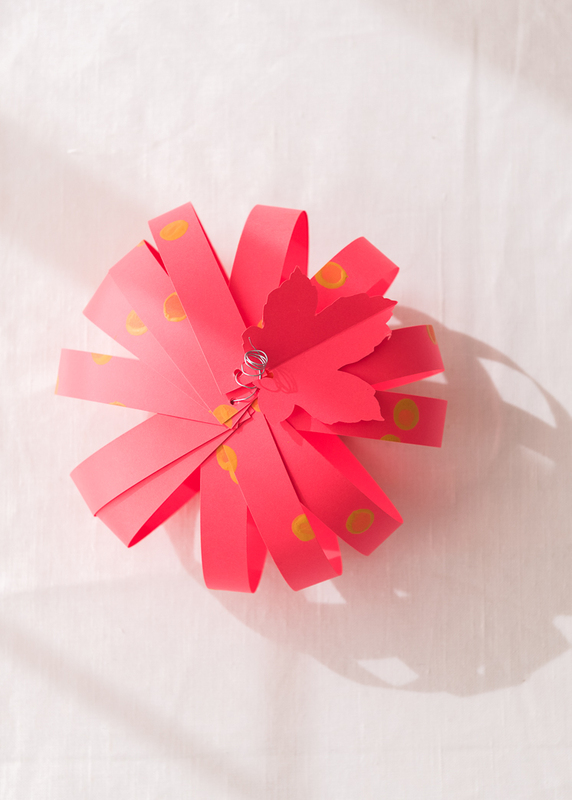 It’s bright and fresh and inexpensive to boot! 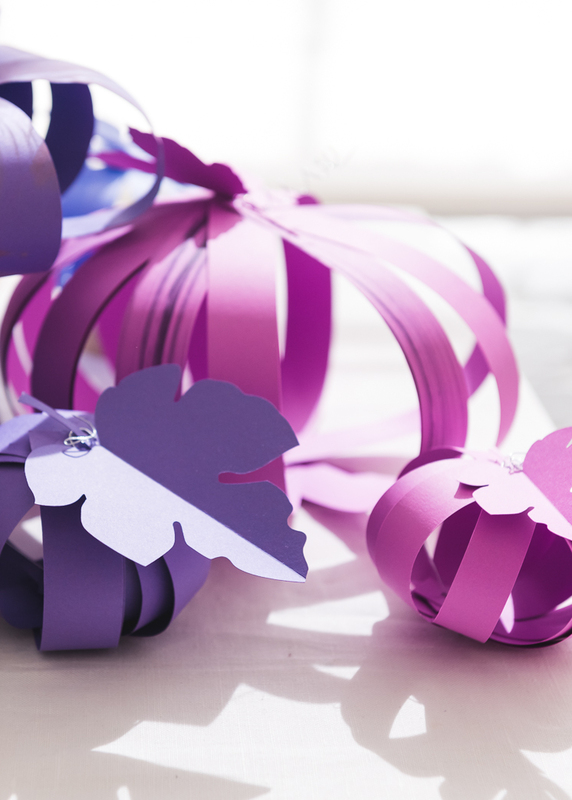 It’s also a great project to involve your kids to keep them busy while you prepare the meal! 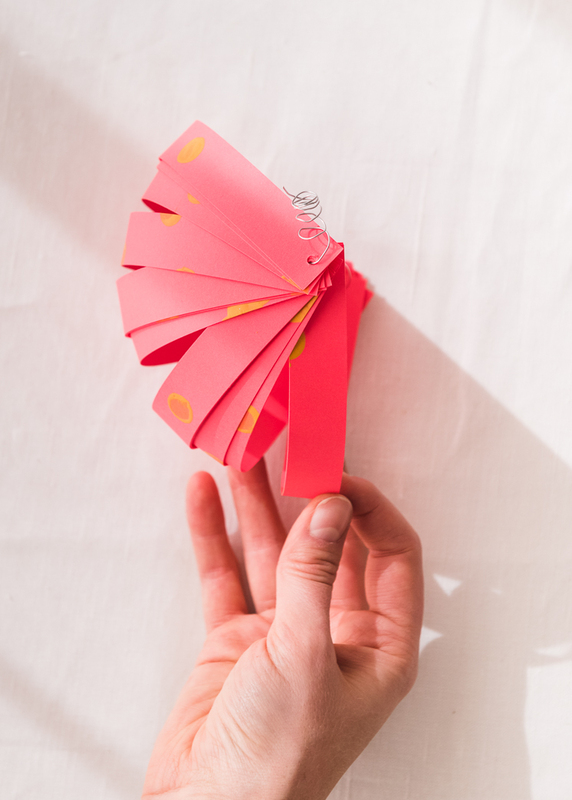 This post was sponsored by Astrobrights Paper. All opinions and content are original. Thank you for supporting the brands that keep Lars thriving! Looks like the leaf template link is missing! Poor little pumpkins need their leaves! Thanks. Also, wouldn’t it be easier to add the leaf before curling the stem? Just a thought…. Apologies, somehow the link got deleted–it’s fixed now! And that’s a good point! It’s not too difficult to attach either way, so whichever method you prefer!